Samo, moriyo or shama millet is used widely for preparing Ekadashi or fasting food. Either on its own or mixed with rajgira flour or arrowroot flour or potato flour. Samo kheer, samo khichdi, samo chila etc. Well, I want to share with you a sweet dish made using samo. Its an easy dish and satisfying. 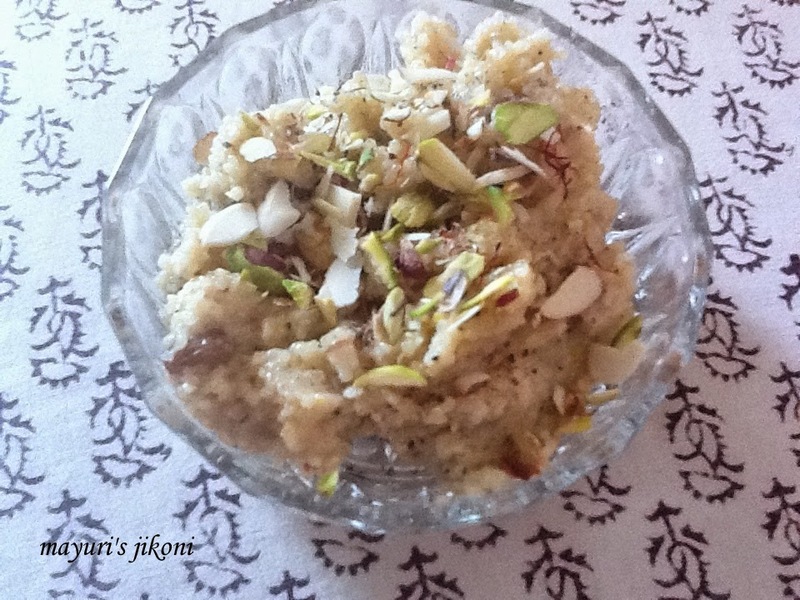 If you know how to make sooji ka halwa or sooji shiro then making this sweet will be as easy as ABC. The texture of the shiro or halwa will entirely depend on how fine or coarse the samo is. I had no choice but to use the coarse on as that’s the only one available in the shops here at the moment. Its an ideal treat for guests during fasting time. 9th June 2014 was Nirjala Ekadashi. Nirjala means without water. The legend goes that Bheem, the second Pandava son could not fast during Ekadashi (there are 24 Ekadashi days in a year) while the rest of the family did. He could not control his hunger pangs. Feeling desolate, he was advised by Maharishi Vyas that he could fast for one Ekadashi day without food or water. So he would fast only on one Ekadashi day in a year. Read more about it here. Wash the samo in clean water about three to four times. Just the way we wash rice. Drain out the water. Put the samo on a clean cloth and spread it out. This way all the water will be absorbed by the cloth. Let the samo dry on the cloth for 20 to 30 minutes. Add the samo and stir it constantly till it turns light pink in colour. This will take about 5 to 7 minutes. Add milk while stirring. Make sure there are no lumps. If there are, break it down using the spoon or spatula. Let the mixture simmer over low heat and stir it frequently. Cook the halwa till the milk evaporates and the mixture begins to thicken. Add raisins. Cook till the mixture begins to leave the sides of the pan. Add cardamom powder, saffron and mix well. Garnish with pistachio and almond slices and serve immediately. For a more creamier texture add ¼ cup of fresh cream when you add sugar. I used full fat milk for halwa. When you pour the milk into the pan, pour it from the side as the steam created may scald your hand. Fine samo will take less time to roast.